Formwork is a temporary but rigid structure in which the cast in situ concrete is laid for casting the members to required shape. It is also known as centering or shuttering. Formwork is placed at its right position before pouring the fresh concrete in it. Poured concrete is then compacted and permitted to solidify to gain strength. The formwork is permitted to stay in position till the concrete achieve enough strength to resist the stresses coming on it without the assistance of the formwork. After this, the formwork is removed. The formwork is permitted to stay in position till the concrete achieve enough strength to resist the stresses coming on it without the assistance of the formwork. After this, the formwork is removed. 1. It should be adequately strong to withstand an extensive variety of dead and live loads. For instance, self-weight, weight of reinforcement, weight of wet concrete, loads of workers, and any other loads during and after casting of concrete. 2. It should be inflexibly built and efficiently propped and supported to hold its shape without undue deflection. 3. The joints in the formwork should be tight enough to prevent leakage of cement grout. 4. The formwork should be created in such a way that it may allow the evacuation of different parts in the desired sequence without shaking or damaging the concrete. 5. The material of the formwork should be inexpensive, easily accessible and can be reused for several times. 6. 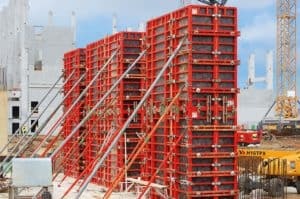 The surface of the formwork should be plain and smooth, and set properly to the desired line and level. 7. The material of the formwork should not bend or get perverted in presence of sun, rain or water at the time of concreting. 8. It should be lightweight. 9. It should be easy to remove. What is the difference between centring and shuttering.